Click Here to register for our e-Newsletter and receive a coupon for 10% off your next order. Register for our free beer workshop. 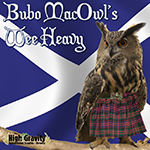 Our wee heavy is malty beer a with complex malty flavors of caramel that is suggestive of a fine dessert. Think of it as a sticky toffee pudding in liquid form. Homebrew kit instructions and ingredients. You can earn 1 Brew Bucks on this product! These kits require configuration. Click on Select Options to order your kit. Named in honor of Donovan (the owl on the label). Donovan owns the human known as Chris Mackechney, our dear friend, employee, and the person who designed this kit. High Gravity's extract kits use only the highest quality ingredients and are assembled when you order so they contain the freshest possible ingredients. Each kit makes 5 gallons. Each kit makes 5 gallons. Click here to view the instructions and ingredients. Extract kits are recommended for beginning brewers. Extract kits contain malt extract along with specialty grains and is by far the most common kit type. Extract kits rely on the malt extract to provide the fermentable sugars and the grains are primarily for color and flavor. This is the most common type of beer kit and is recommended for those who are just getting started or those that want to make a great tasting beer without a lot of effort. BIAB Kits require additional brewing knowledge. Brew-in-s-Bag eliminates the extract and completely rely on the grains to produce the fermentable sugars needed to make the beer. BIAB uses one vessel to steep the mash and to boil the wort with the entire volume of liquid added at the start of the mash. This method also requires that the entire volume be boiled so a 40qt+ pot is needed to boil the wort (pre-fermented beer). It is recommended that you have some experience brewing extract kits before attempting all-grain. All-grain kits eliminate the extract and completely rely on the grains to produce the fermentable sugars needed to make the beer. Additional equipment is required, such as a mash tun and hot liquor tank. This method also requires that the entire volume be boiled so a 40qt pot is recommended to boil the wort (pre-fermented beer). All-grain brewing is the most advanced method for brewing beer and is recommended for those that have had some experience brewing extract kits. We recommend liquid yeast for our High Gravity kits but if you would prefer dry yeast, you can select it instead. Liquid yeasts provide a wider range of flavor profiles but are very susceptible to temperature variations. This can cause problems when shipping during very hot weather. Dry yeast, however, will not be damaged in transport because of weather conditions. You may also want to choose your own yeast. If so, you can select the "No Yeast" Option. When shipping liquid yeast, an ice pack is highly recommended, especially during hot weather to help ensure the viability of the liquid yeast. There is an additional cost of $1.00. High Gravity will not guarantee the viability of liquid yeast shipped without a cold pack.